I have an exciting project I’ve been working on all summer and finally, the day is here to tell you all about it! 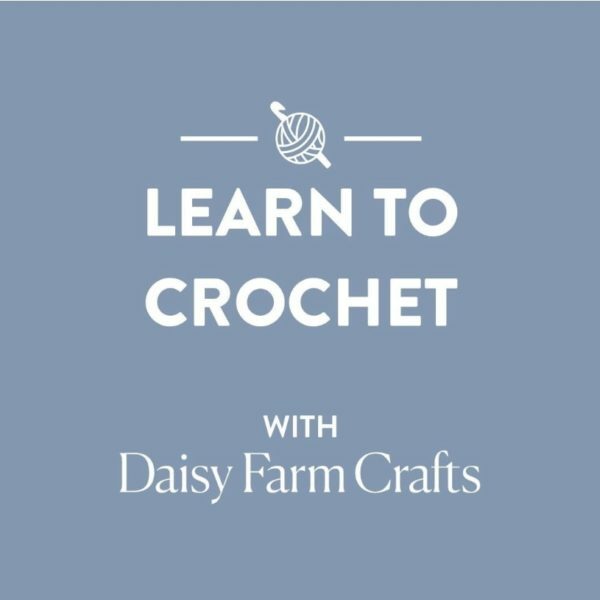 Yarnspirations.com and I are offering you a beginner friendly, (At least I hope so! 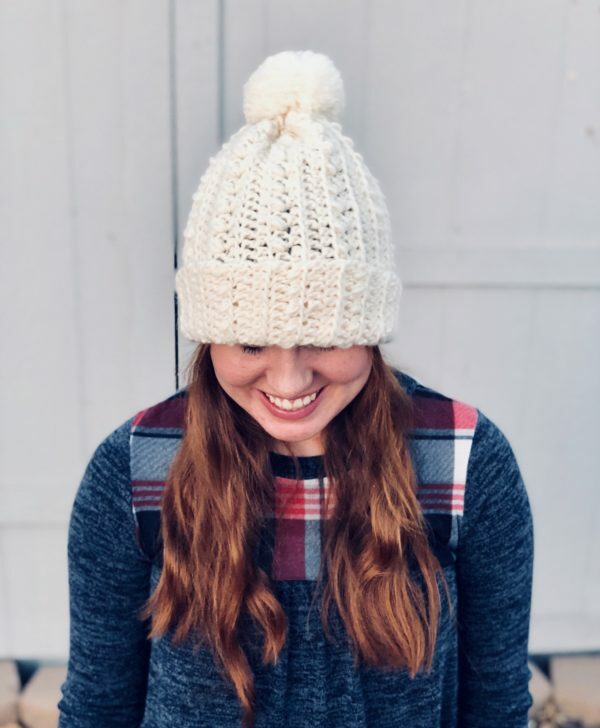 I designed it, and Hannah tested it so we think you can do it if you have a few basics of crochet under your belt,) scarf, hat, and mittens project to make this fall! You can sign up for the emails and the program for free! We will start with the scarf and I teach you with video help. The pattern and links to the videos will be delivered to your email inbox after you sign up. If you’ve been following me along for a while, the stitches I chose are ones I’ve been using and teaching to you already! 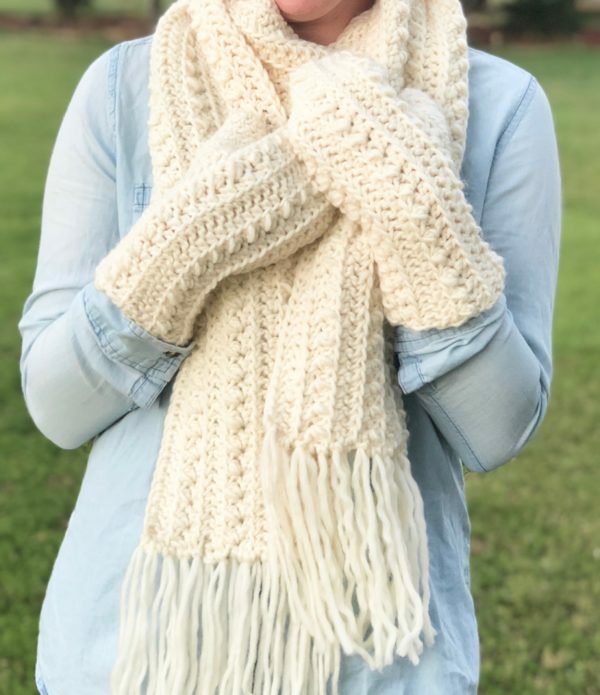 I used the modified half double crochet, which as I’ve now learned by working with the professional designer at Yarnspirations, has an official name and symbol–Half Double Crochet, Front Two Loop stitch (HDCF2L). I also will teach you to add one more step to the HDCF2L stitch and turn it into a cluster. Yes, it’s just one extra step and you get those faux looking cables. (That was the look I was going for in the easiest possible way!) And guess what the symbol is for that stitch? The HDCF2LCL stitch. Whew! That’s a lot of letters, but when you break it down, it all makes sense: HDC (Half Double Crochet) F2L (Front 2 Loop) CL (Cluster). 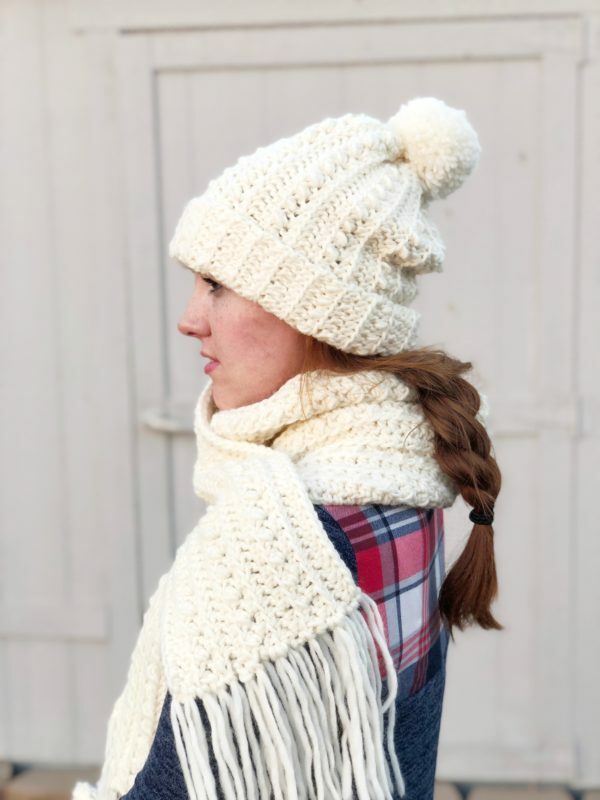 After you learn the scarf, the hat will be a piece of cake to make! I’ve designed it to be so easy to make a rectangle and sew the sides together and gather the top. No counting rounds, and increasing or decreasing as you go. 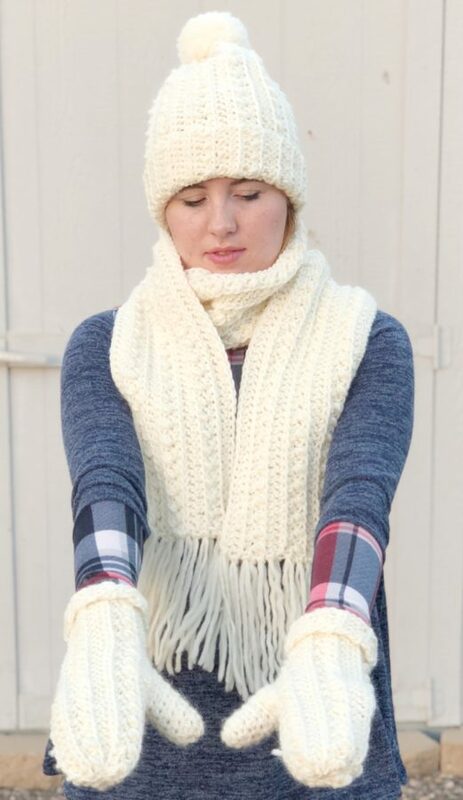 And after you’ve got the scarf and hat under your belt, the pair of mittens will be a breeze! 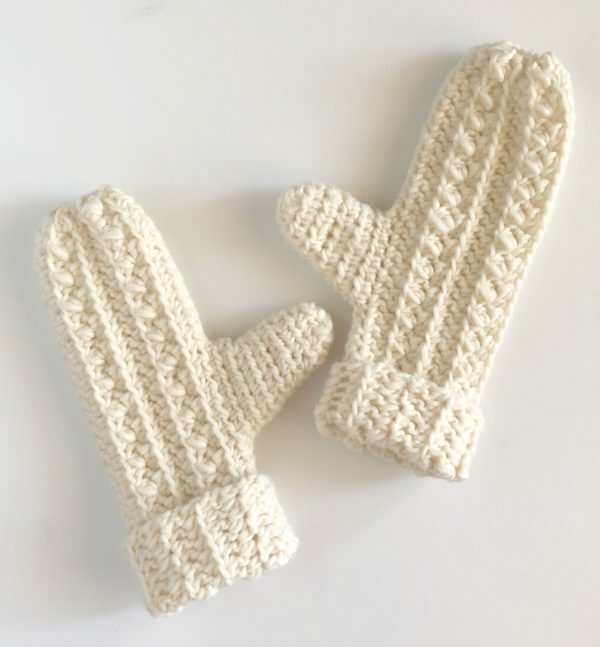 The mittens are crocheted in the same manner as the scarf and hat, you’ll only be sewing up one side and leaving an opening for the thumb. Then you simply will crochet in the round, with only one decrease (which means skipping a stitch) every time. I promise you it is easy. I was thrilled to figure it out and have it work up so nicely. As I mentioned above, I designed these projects over the summer and needed Annie to be my model for me. Unfortunately for her, it was the hottest day of the year! She was a trooper! We just made it work as best we could and laughed as sweat was pouring down her face. She is so much fun to photograph though and always seems to strike the best poses! I’m nervous and excited at the same time to launch this program with you all! I’m nervous because I don’t want any of you to be afraid of the professionally written pattern. When I showed it to Hannah, she thought at first there was no way could she do it, but when I was able to explain to her, and when she watched the videos, she picked it right up after a few tries. Professionally written patterns can be so intimidating. They cut out so many words and can pack so much instruction into a paragraph. And you know me, I can’t get any instruction out in less than five sentences, at least! But I will be here to help you. I promise. 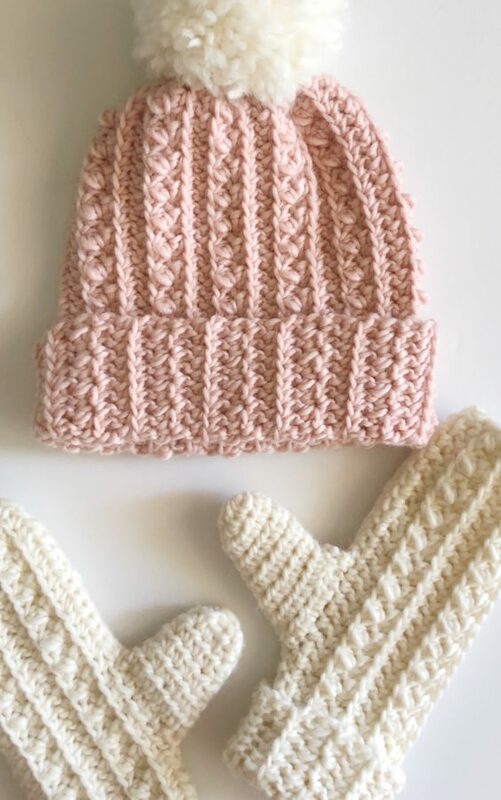 There is nothing that would make me happier than you if share a picture of your completed hat, scarf or mittens with me and then let me share it with all the Daisy Farm followers on Facebook or Instagram. I hope you’ll give the scarf a try! I will be posting again with each project with more tips and tricks to help you get the scarf started. You can do it! I’m excited to see your finished scarf.